A day of education and networking; your attendance is so important that we will cover hotel and registration for one person from each PACE member entity. Have access to all PACE Day's information at your fingertips. Customize the conference agenda, schedule your personal meetings, view information about keynote speakers, workshop presenters and partners, and receive notifications of important updates. You will find the app in the Google Play or Apple stores by searching for PACE EVENTS and download the app created by Pathable. *For the first attendee per member entity: Make your hotel reservations directly with the hotel and we'll take care of picking up Wednesday night April 17, 2019 only with the hotel. You will be responsible to pay for additional guests and incidental and if you cancel less than 72 hours prior to your stay or do not show up. If hotel rooms are not available, contact Sarah Herb at 503-400-3047 or sherb@osba.org for additional options. We will not reimburse your hotel cost unless you book your room through the group block at the Grand Hotel or through one of the additional options. If you need to cancel your hotel reservation, please email (sherba@osba.org) or call Sarah Herb at 503-400-3047. Registration no shows will be charged a $75 fee to cover the cost of meals and materials. There is a $50 fee for each cancellation received after April 11, 2019. Choose "Registration - additional attendees"
Ms. Jacobson will provide advice on conducting workplace investigations in the school setting including a discussion of recent court and District Attorney decisions that may impact whether workplace investigations are considered privileged and/or are exempt from public record requests. She will also discuss the recent Oregon Court of Appeals decision in Meyer v. Oregon Lottery, in which the court held that workplace investigations into consensual romantic relationships between employees may violate the employees’ First Amendment right to intimate association. This presentation is appropriate for all PACE members including community colleges, education service districts, school districts and charter schools. Mr. Hungerford and Ms. Schiers will discuss recent special education litigation trends including what issues are leading to litigation, the different types of legal action parents are using (internal complaints, ODE/OCR complaints, and litigation), and how best to avoid legal problems in this complicated area. This presentation is geared towards a K-12 audience. Members of the TSPC Professional Practices Unit will provide advice on the investigation of educator misconduct occurring within schools. The session will provide guidance on a wide spectrum of related topics including: when to report to TSPC, how to conduct more effective local investigations, what TSPC may ask of the district during a TSPC investigation, how does the TSPC professional practices process work - from open investigation to case closed, and a look at some trend data regarding educator misconduct in Oregon. The presentation will allow for participants to collaborate with both TSPC representatives and fellow participants on these important issues. This presentation is geared toward a K-12 audience. To keep a school building ready to educate kids there are many steps and processes. Some are complex and some are simple. Facilities maintenance can be broken down into five different processes and the building can be broken into manageable segments like roofs, foundations, and exterior walls. This session is designed to provide you with an overview of how to inspect, who should inspect, and what should you be looking for in your inspections. It can also help the casual observer identify and report problems. It's a high level overview to help the building administrator be more knowledgeable about their multi-million dollar responsibility, but not about actual repairs. This presentation is relevant to all PACE members including community colleges, K-12 school districts, charter schools and education service districts. Sean Hoar manages an incident response team that will respond to over 1000 data security incidents this year. Based on that experience, Sean will review current online threats from malicious actors that pose the greatest risks to information systems. This session will include a discussion of measures necessary to mitigate those risks, and the critical importance of being prepared for a rapid response. It will also involve a discussion of the component parts of rapid responses to different types of data security incidents affecting both operational and sensitive data. These responses will involve considerations of cost, scale, business impact, and regulatory compliance. The session will also include a discussion about why a rapid response, whether it be to an encryption attack or an email account compromise, is essential to preserving organizational reputation and minimizing economic harm. If you are concerned about how to mitigate the risk of the greatest risks to information systems, you won’t want to miss this session!! This presentation is relevant to all PACE members including community colleges, K-12 school districts, charter schools and education service districts. Two of OSBA/PACE litigation attorneys, Mrs. Sterling and Ms. Williams, will discuss the frequent sources of employment litigation that arise from employee discipline and termination. This presentation will cover the basics of employment due process and is relevant to all PACE members including charter schools, K-12 school districts, community colleges and education service districts. Mersereau Shannon represented the Dallas School District and Sutherlin School District in lawsuits filed by privacy groups alleging that transgender students should not be allowed to use the bathroom of the gender with which they identify. The firm also represented the Hillsboro School District with respect to the First Amendment lawsuit where a student alleged his First Amendment speech rights were violated when he was prohibited from wearing a t-shirt stating, “Boarder Wall Construction Co.” and “The Wall Just Got 10 Feet Taller.” The firm’s attorneys will discuss these cases and student civil rights litigation generally. This presentation is geared towards a K-12 audience. Session participants will discuss current issues and policy requirements surrounding the use of restraint and seclusion in public schools. Session participants will: Understand the requirements pertaining to the use of Physical Restraint and Seclusion in public education programs, understand best practices regarding both implementation and reporting requirements, receive answers to the most common questions regarding restraint and seclusion in public education programs and discuss ethical issues, Q&A will be at the end of the session. This presentation is relevant to all PACE members including charter schools, K-12 school districts, community colleges and education service districts. This presentation will review the importance of providing an education environment where students and teachers feel safe. Specifically, the presenter will review the fundamentals of reducing school violence, explain the threat assessment process and highlight the collaborative, multi-agency structure of the Mid-Valley Student Threat Assessment Team (MVSTAT) that serves the Willamette Valley schools. Finally, the presenter will review the referral steps necessary to access the threat management resources and consultation available through the MVSTAT. This presentation is geared towards a K-12 audience. Did you realize that every record your school or college creates is a public record including emails and text messages and that you are only permitted to destroy those records in accordance with the Secretary of State’s record retention schedule? Mr. Porter will provide advice regarding how to avoid creating public records that could potentially cause embarrassment for the school or college and in some cases create legal liability. He will explain the deadlines associated with responding to public records requests and the consequences of failing to promptly respond. There will also be a discussion regarding the common exemptions that allow a school to refuse to turn over records in response to a public records request including requests for student records, investigatory reports, personnel files, employee discipline and the other commonly requested documents. This presentation is relevant to all PACE members including community colleges, K-12 school districts, charter schools and education service districts. Sean Hoar manages an incident response team that will respond to over 1,000 data security incidents this year. Based on that experience, Sean will review current online threats from malicious actors that pose the greatest risks to information systems. This session will include a discussion of measures necessary to mitigate those risks, and the critical importance of being prepared for a rapid response. It will also involve a discussion of the component parts of rapid responses to different types of data security incidents affecting both operational and sensitive data. These responses will involve considerations of cost, scale, business impact, and regulatory compliance. The session will also include a discussion about why a rapid response, whether it be to an encryption attack or an email account compromise, is essential to preserving organizational reputation and minimizing economic harm. If you are concerned about how to mitigate the risk of the greatest risks to information systems, you won’t want to miss this session!! This presentation is relevant to all PACE members including community colleges, K-12 school districts, charter schools and education service districts. Charter schools, K-12 school districts, community colleges and education service districts frequently engage with outside third parties for a variety of reasons: student work study programs, service providers, medical and dental services for students, etc. OSBA attorneys will go over the common third parties, which school staff have authority to contract with these outside entities, and the key contract provisions you should have with each of these third parties including common pitfalls like failing to conduct criminal background checks on third parties that have access to students. The community college environment provides for unique challenges in reunification planning. This session will address the basic consideration, identification of challenges, and through discussion develop concepts and solutions for plan development. Charter schools, K-12 school districts, community colleges and education service districts districts frequently engage with outside third parties for a variety of reasons: student work study programs, service providers, medical and dental services for students, etc. OSBA attorneys will go over the common third parties, which school staff have authority to contract with these outside entities, and the key contract provisions you should have with each of these third parties including common pitfalls like failing to conduct criminal background checks on third parties that have access to students. Session presenters will share some of their "lessons learned" from losses (and other interesting experiences); from the perspective of the risk management team. Presenters will share information they wish they had known prior to the loss and what they recommend so that your school district can reduce the risk of a similar experience. Pupil transportation experts will discuss statistics and information encompassing all facets of the school bus. From licensing requirements to accident data, school bus driver training to driver shortages, pupil transportation responsibilities to key performance indicators, learn what happens behind the scenes in the "Yellow Bus World". Does your college, charter school or school district have equal gender participation in school athletics? Are you regularly sending out student interest surveys to increase your female participation numbers? Does your baseball field have amenities like batting cages, reader boards, bathrooms, locker rooms, and a more preferable location while your softball field lacks these amenities? If you do not know the answers to these questions, or you are concerned by your answers to these questions, you are not alone. Come listen to OSBA attorneys discuss the common Title IX violations in school athletic programs and potential solutions to move towards compliance. Annexes to the EOP may be Functional, Threat or Hazard specific and focus on critical operational functions during a response. Presenters will discuss the needs assessment process, identify resources and considerations for annex development. Mr. Abraham will provide a review of the most important developments in labor and employment in the past year, including the U.S. Supreme Court’s decision in Janus and recent legislative changes relating to Oregon’s New Equal Pay Act. The program will help attendees understand employer responsibilities, identify where to focus on compliance, and provide practical methods for implementing the new laws and policies within their respective workplaces. This presentation is applicable to all PACE members including community colleges, school districts, charter schools and education service districts. Rebekah Jacobson, shareholder, Garrett Hemann Robertson P.C. Exhibitor registration for PACE Day is now open. Thank you to our partners, sponsor and exhibitors! The training day will be held April 18, 2019, at the Salem Convention Center. Click here for the survey to become an exhibitor. View the exhibitor floor plan. All cancellations must be submitted in writing to PACE BEFORE March 4, 2019 . No refunds will be made after March 4, 2019. Thank You to our Partners, Sponsors, and Exhibitors! Your attendance is so important that we will cover hotel and registration for one person from each PACE member entity. 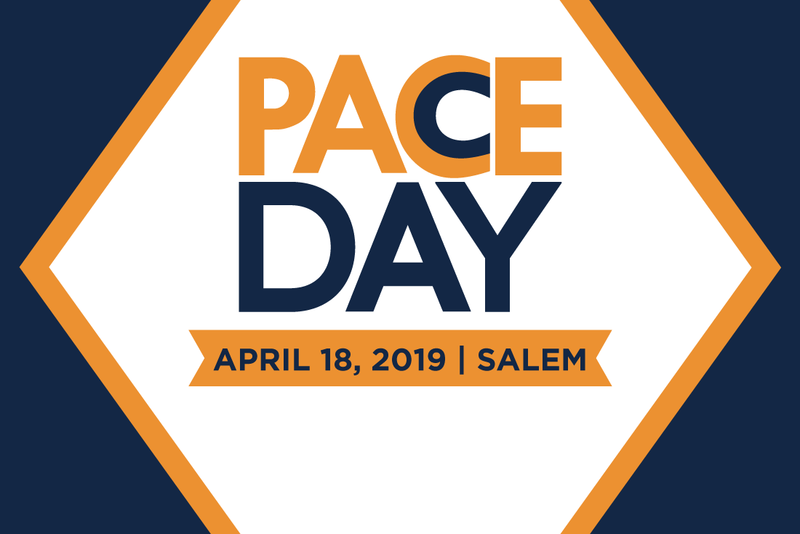 If you would like to register for PACE Day, please contact Meghan Peterson (mpeterson@pace.osba.org) and she can either register you or modify your existing registration. Event registration does not reserve your hotel room. You must make your hotel reservation directly with the hotel. No shows will be charged a $75 fee to cover the cost of meals and materials. There is a $50 fee for each cancellation received after April 11, 2019. *For the first attendee per member entity: Make your hotel reservations directly with the hotel and we'll take care of picking up one night directly with the hotel. You'll just need to pay for any additional guests and incidentals when you check out. You will be responsible for paying for your hotel if you cancel less than 72 hours prior to your stay or do not show up. Click on "Travel Information" for hotel details. For the first attendee per member entity: Make your hotel reservations directly with the hotel and we'll take care of picking up Wednesday night April 17, 2019 only with the hotel. You will be responsible to pay for additional guests and incidental and if you cancel less than 72 hours prior to your stay or do not show up. The group rate is guaranteed through April 4, 2019. All reservations are on a first-come, first-served basis. If hotel rooms are not available, contact Sarah Herb at 503-400-3047 or sherb@osba.org for additional options. We will not reimburse your hotel cost unless you book your room through the group block at the Grand Hotel or through one of the additional options. PACE has a block at the Phoenix Inn Suites in Salem if you are unable to secure a room at The Grand Hotel. Please call the Phoenix Inn Suites at 503-588-9220 to book your room and make sure to tell them it's for PACE. Information about The Grand Hotel's room types and amenities is available on the hotel website or by calling the hotel at 877-540-7800 or 503-540-7800. We encourage you to carpool if you are attending with others from your district. There is parking beneath the Conference Center; the entrance is on Liberty Street by the Grand Hotel. If the parking lot is full, there is overflow parking nearby at Pringle Plaza. Be sure to park on the top level for free, all-day parking. Click here for a map for your reference. 8:30 a.m Special Education: How not to get sued and what to do if you are.